Wharncliffe Woods have been part of the Sheffield scene since day one. Now there’s a new generation of builders and riders taking it to the next level, led by the Clayspades crew. 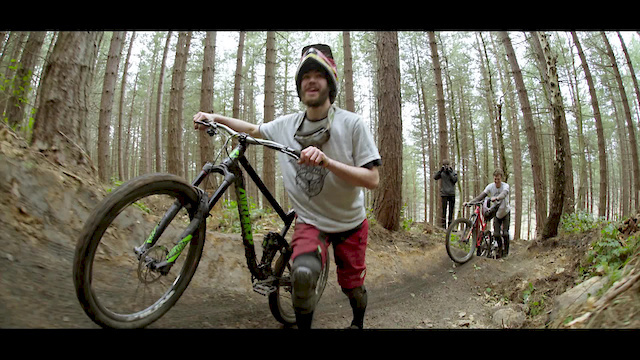 Max, James and Rob may not be household names, but you’ll recognise their trails. We thought it was time for the builders to take centre stage. This is Clayspades. Makes me wanna ride...and rap. The trails and the riders are awesome. Props on the sick video. I love raw vids, but this is SICK. Beastly riding to the Beastie Boys. Damn, I gotta go ride like NOW. Crash at :24 looked brutal. Sick riding though. Ha ha, made me go back and look! I think that this bicycle riding was very good. That's is how it's done! Great trails, riding, and good music. Muchas gracias amigos! Epic riding and a sic edit, I've been meaning to get to Wharncliffe and Greno for ages, gotta go now. Only problem is I don't got these guys skills! @finbar120 what about this spot for the road trip? By far one of the most badass, get out and ride inspiring video I've seen! British coastal crew for real!!! That vid was sooooooo good! Really well shot vid and some awesome riding!! Decent edit lads! Need to ride Wharncoover soon! Damn. Just watched three times back to back to back. Such sick riding and trails! This is getting silly now pinkbike....surely you can find videos with all the talent and stuff uploaded to this site? Without picking videos that have been on the front page? Don't mean to complain but find it tiring with so many regurgitated videos chosen. Just a little side note about my comment. In no way am I saying this doesn't deserve to be vod,they've clearly done a lot of work and I really like the video,I did when I first saw it a few weeks ago on the front page.I mean no offence to the film maker,the riders nor pinkbike editors.if people disagree with me that's fair enough I just wanted to clarify I was generalising and not targeting.I look forward to seeing what's vod and just got a bit tired of seeing videos that have featured on the home page.my bad,just an opinion.